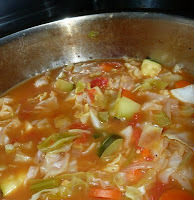 I've created lots of variations on cabbage soup. Here's my opus on how to make cabbage soup in case you'd like to see how to vary this or use other ingredients you may have in the house.. This recipe cost me with all my bargain food shopping approximately $3.60 or about 45 to 60 cents a serving. Put oil in large soup pot. Heat over medium high heat. Saute onions and garlic until light brown. Add carrots saute for a few minutes, add celery and cabbage, saute until cabbage is wilted. Add zucchini and saute a few more minutes. Add salt, pepper, red pepper flakes and Italian seasoning. Mix well and saute a few minutes. Add tomatoes, their juice and the stock. Bring soup to a simmer, lower heat and cover. Simmer until all the vegetables are tender. Taste and correct seasoning. Add vinegar and sugar. Simmer a few minutes for flavors to meld. Taste again. Add more sugar or vinegar to make sure you have the sweet and sour balance as you would like it. Here's a delicious-looking red cabbage variation from Simply Recipes. Yum, this sounds like something my mom and aunts would have made but didn't.